Seaweeds have been receiving increasing attention as a promising natural source of antioxidants. The present study aimed at evaluating seasonal variations in the antioxidant content and activity of the sugar kelp, Saccharina latissima, cultivated at two sites in Denmark from May 2013 to May 2014. The extraction performance of two solvents, methanol and ethyl acetate, was compared, with methanol extracts resulting generally in higher total phenolic content (TPC), total flavonoid content (TFC), and total antioxidant capacity (TAC), all determined spectrophotometrically. Phenolic compounds (phloroglucinol, phenolic acids, and flavonoids) were evaluated by HPLC-DAD. TPC was higher in November and January (1.23–2.41 mg GAE g−1 DM) compared to that in September. Contrary, the highest TFC was found in September (4.56–4.83 mg RE g−1 DM; p ˂ 0.05). The pigment profile did not change seasonally, whereas fucoxanthin and chlorophyll a were the most abundant. Fucoxanthin concentration was lower in September compared to all other months (261–665 μg g−1 DM; p ˂ 0.05). TAC was significantly higher in November (3.84–4.05 mg GAE g−1 DM). Regarding the antioxidant activity (DPPH), there was no significant difference in the IC50 between seasons, although it was tendentiously lower in September and November (0.42–0.49 mg mL−1). Statistical analysis revealed a strong positive correlation between TPC and TAC; additionally, TPC and TFC contributed positively for the radical scavenging activity. There was no significant difference for all the analyzed variables between cultivation sites. 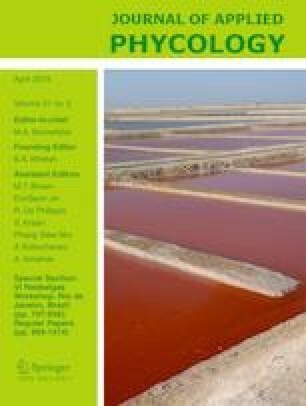 This study reveals marked seasonal variations, and high biological variability (difference among replicates) in the antioxidant content of S. latissima, and substantially lower antioxidant capacity compared to other species such as Fucus sp., which needs to be taken into account when considering seaweed as a commercial source of antioxidants. Thanks are due to our project partners: Danish Aquaculture Organization, Orbicon, DHI, TrippleNine, and Hjarnø Havbrug A/S. Special thanks are due to Hjarnø Havbrug A/S for providing practical help and logistics at sea. This study was supported by The Danish AgriFish Agency (GUDP)—Grant No. 3405-11-0375.